Amid such calamity, investors must find a way to progress. Most investing is speculation, and the greater the speculation, the greater the risk. In today’s volatile climate, nearly all stock market investments include a higher level of risk, and investors must be wary of the direction the wind is blowing with every corporate investment made. Risk tolerance is a key component of an investor’s psychological makeup, and one that advisors study and respond to. But when the atmosphere for investing changes, it is up to the advisor to inform the investor that the risk factors have been altered. Apparently, that is not happening to a great degree. 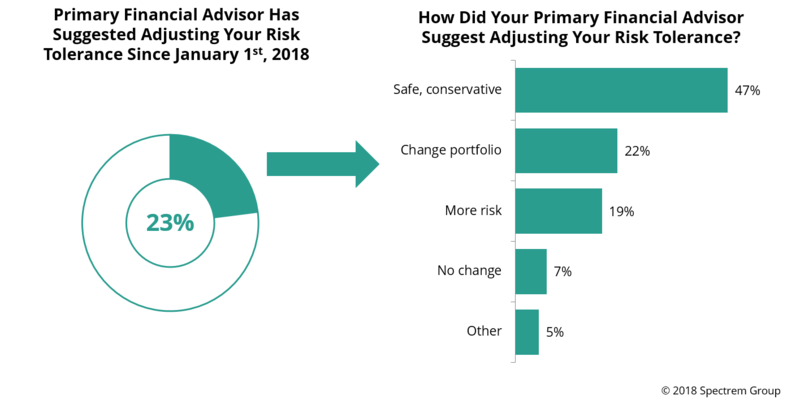 As part of its monthly survey of investors with a net worth of at least $100,000 (not including primary residence), Spectrem asked investors whether they have discussed their level of risk tolerance with their primary advisor since the start of 2018. In that time, tariffs have colored almost all discussions related to global trade, and negotiations with major trade partners have produced no lasting results. Nobody can say for certain how American exports and imports will be affected, making the art of investing in 2018 about as risky as it has been for the past decade. However, only 23 percent of all investors say they have discussed their risk tolerance with their advisor. Thirty percent of investors who self-define as being aggressive or most aggressive say they have discussed a change in risk levels in the past six months, but that is still not a high percentage. Risk tolerance is a very personal aspect of an investor’s psyche, but it is one that can be affected by an advisor’s knowledge and strategy. In perilous times, a conversation about reducing risk might be appropriate for any investor, and especially for investors who are active in managing and contemplating their investments. Of those investors who have been advised to reconsider their risk tolerance, almost half (47 percent) have been told to move into less risky investments. Twenty-two percent have been told to consider changing their portfolio dramatically to battle current inconsistent conditions, while 19 percent have been encouraged to consider riskier investments in an attempt to take advantage of the current volatility of the market. There is no way to predict when market conditions will normalize. Summers months are supposed to be the slow months for investing, but tariff talk has not settled down and the threat of new tariffs from China will hang overhead for several months. A conversation about risk tolerance is never a bad idea. In today’s marketplace, it seems almost necessary to protect an investor’s portfolio from sudden movements within the market.